I moved to Manhattan ten years ago, and while I was applying for every job with “entry level” in the description, I found myself contemplating my career path by thinking a lot about my childhood hopes and dreams. I remember wandering the city streets asking myself, “If I could do anything, what would it be?” I knew. It was the same response I’ve had for as long as I can remember. If I could do anything, I would write and illustrate a children’s book. But all of a sudden it felt like that goal had an expiration date. I was no longer looking ahead to adulthood - I had arrived! - and my 21-year-old self decided it was time. I kept at it for a few years while a lot of other life happened — promotions and roommates and break-ups, oh my! — and in 2011, I decided to switch gears a bit. I realized how much I benefitted from the creative outlet of those classes, but I decided to branch out and try Parson’s Greeting Card Design. That class will always remain such a blessing, but it wasn’t the teacher or lessons that changed my life -- it was a fellow classmate. I met a pointed-pen calligrapher who introduced me to her craft, and it immediately reminded me of my oldest brother’s gorgeous, ornate lettering that inspired me throughout childhood. I knew I had to learn. Truthfully, it took me a really long time to figure out what the heck I was doing, and I’m fairly certain I didn’t look up from my pen and paper for the following three years. After learning a lot about what not to do, I invested in several workshops and conferences that taught me how to properly use my tools. I fell in love with every little thing about calligraphy. People started hiring me and buying my products, and in 2014, I left my day job to focus on the small business I had built on the side. Since then? It’s been a complete blur. But on the other hand, I can look at each stage and identify what prayers lead to what introductions and what introductions lead to what opportunities and what opportunities opened what doors. I chose to simply focus on creating, on working my little heart out, actively praying and searching for more. Life has always surprised me with its path and timing, and it was no exception when, at the end of 2016, a new door led to an old dream. I wrote a book. (!!!) Even just typing those four words makes me have to walk away from my computer and pace the small width of our apartment. Did I illustrate it? Yes. Is it for children? Yes. Is it about one of my favorite topics in the world? Yes. 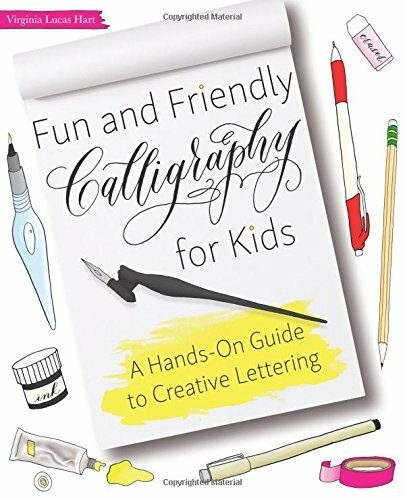 I am thrilled to announce that Fun and Friendly Calligraphy for Kids; A Hands-On Guide to Creative Lettering is being published by the wonderful team at Ulysses Press and is currently available for pre-order online at Barnes and Noble, Amazon, Books-A-Million, Walmart, Target, and more. It will be available November 15th, but may even ship as early as next month! Anticipating what might go wrong, I included a ton of troubleshooting tips along the way so it feels like I’m right there with you -- and photos taken by my kind and talented friend, Minnow Park, help me demonstrate exactly what I mean. After helping you learn all of the important basics, test out different methods, and develop your own unique style, I give you ways to continue practicing in order to refine your new, amazing skill! In the final part of the book, you'll put your calligraphy to use in creative projects -- personalized gifts, cards for special occasions, envelope addressing, logos, monograms, signatures, and more! Inspired by the children I’ve taught in either group classes or one-on-one settings, I listened to what made my students so frustrated they burst into tears and threw their pens across the table. (true story) I noticed how they shook with pure joy when they figured out their best writing angles. I watched what made their eyes light up in curiosity and delight about fun ways to use calligraphy. I held their papers and realized they're just as capable as adults to create beautiful lettering. In fact, their imaginations truly give them an advantage. I continue to read how many schools are replacing cursive and handwriting curriculum with computer-based lessons and I worry about all of the longterm effects. I bite my tongue when more and more people abandon the simple notion of a thank-you note, and I realize so much of that education and encouragement starts at home. My new hope? ...is that this book will find its way into homes and into the hands of those who want to learn -- and for them to have FUN while doing so! My new dream? ...is that it inspires at least one child out there to use and preserve the wonderful art of calligraphy, to celebrate the specialness of their unique handwriting style, to send and cherish love-filled mail, and to know the importance of their own hopes and dreams. I adore Estée Lauder's brand and products, and it's been such an honor to contribute my handwriting to their beauty events. I was absolutely thrilled to work with them again! I love when a company recognizes the specialness that hand-lettering can add to a product, to a display, and to an atmosphere. Below are a few images from the fabulous Estee Lauder team that I wanted to share! One of my favorite steps of my nightly skin regimen is Estee Lauder's Advanced Night Repair, pictured above! There's a reason it's been voted the #1 serum, and has over 2,000 glowing reviews on their website. I could stare at this photo ^ for daysss. I love things in color order! See more photos from another beauty event plus 20 of my favorite quotes by the Estée Lauder here!